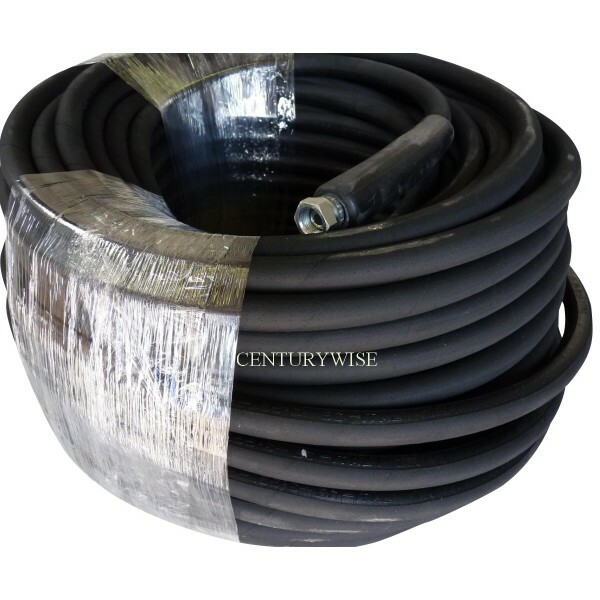 PROFESSIONAL QUALITY REPLACEMENT PRESSURE WASHER HOSE FOR DRAIN JETTING MACHINES. 91 MTRS. ( 300 feet ) OF 2-WIRE, 400 BAR HIGH PRESSURE HOSE WITH STANDARD 3/8"F BSP ENDS.... MANY OTHER COUPLINGS AVAILABLE TO ADAPT TO YOUR MACHINE. 3/8" HOSE IS GENERALLY SUITABLE FOR 5" TO 10" BORE PIPE LINES. HOSE IS FOR MACHINES UP TO 5800 PSI OUTPUT, WITH FLOW OF 15 TO 45 LITRES PER MINUTE.